Color matching powder coating for any parts is available. 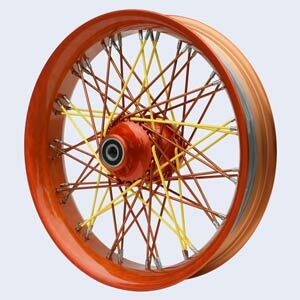 Front wire wheels for with 25mm sealed wheel bearings are available. 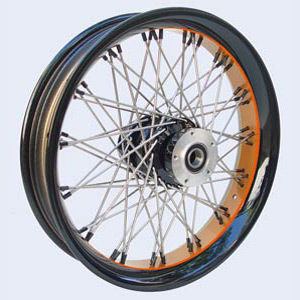 None of the products as spokes, hubs, dimpled or non-dimpled rims, rotors, pulley, powder coating, chrome, black nickel, black chrome or gold plating, art design appearing on this web site are licensed, manufactured, sponsored or endorsed by Harley-Davidson, Inc. Use of the word Harley-Davidson, motorcycle model names and designations are provided solely for reference and application information, and there is no affiliation between Harley-Davidson, Inc. and HD Wheels Corporation. The names: Street Rod, Blast, Buell, Cyclone, Disc Glide, Electra Glide, Evolution, Fat Boy, Firebolt, HD, H-D, Harley, Harley Davidson, Harley-Davidson, Heritage Softail, Heritage Springer, Hugger, Lightning, Low Rider, Night Train, Road Glide, Road King, Roadster, Screamin’ Eagle, Softail, Sport Glide, Sportster, Springer Softail, Sturgis, Super Glide, T-Sport, Tour-Pak, Tour Glide, Twin Cam 88, Ultra Classic, Wide Glide and V-Rod are registered trademarks of Harley-Davidson, Inc., Milwaukee, Wisconsin, U.S.A. 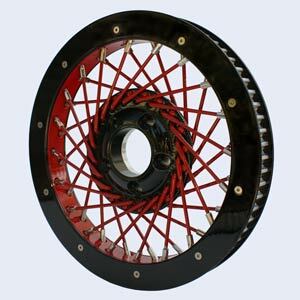 The following model designations for Harley-Davidson motorcycles are used in this web-site for reference only: EL, FL, FLH, FLHR, FLHRCI, FLHS, FLHT, FLHTC, FLHTC Ultra Classic, FLHTC-I, FLHTCUI, FLHX, FLST, FLSTC, FLSTF, FLSTN, FLSTS, FLSTSC/I, FLT, FLTC, FLTC Ultra Classic, FLTCU, FLTR, FLTRI, FLTRSEI, FX, FXB, FXD, FXDB, FXDC, FXDG, FXDL, FXDS-CON, FXDWG, FXDX, FXDXT, FXE, FXEF, FXLR, FXR, FXRC, FXRD, FXRDG, FXRP, FXRS, FXRS-CON, FXRSE, FXRS-SP, FXRT, FXS, FXSB, FXST, FXSTB, FXSTC, FXSTD, FXSTD-I, FXSTS, FXSTSB, FXWG, GE, K, KH, VROD™, VRSCA, VRSCB, WL, WLA, XL, XL1100, XL1200, XL1200C, XL1200R, XL1200S, XL883, XL883C, XL883R, XLCH, XLCR, XLH, XLH1100, XLH1200, XLH1200, XLH1200S, XLH883, XLR, XLS, XLS, XLT, XLX, XLX, XR1000 and their connection to Harley-Davidson® factory part numbers, as well as any printed matter, are not intended to imply that any of these parts are Harley-Davidson® original equipment. 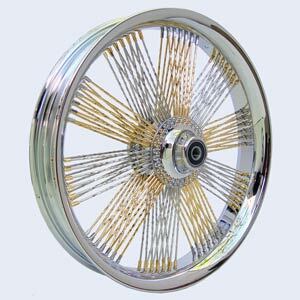 Although the quality of spoke wire wheels and rims listed here exceeds OEM specifications, none of these items are manufactured by Harley-Davidson® Motor Company. The words: Bad Boy, Convertible, Deuce, Duo-Glide, Hydra-Glide, Revolution and Thunderbolt are trademarks of Harley-Davidson, Inc., Milwaukee, Wisconsin, U.S.A.
None of the products as dimpled or non-dimpled rims, spokes, pulley, hubs, rotors, chrome, black nickel, black chrome or gold plating, powder coating, art design appearing on this web site are licensed, manufactured, sponsored or endorsed by Victory Motorcycles and Polaris Industries , Inc. Use of the word Victory Motorcycles, various model names and designations are provided solely for reference and application information, and there is no affiliation between Victory Motorcycles and Polaris Industries , Inc. and HD Wheels Corporation. The name: Victory Vegas™, Victory Kingpin™, and Victory Vegas 8-Ball™, Kingpin, Vegas, Hammer, Touring Cruiser, 8-Ball, Ness Signature Kingpin, Ness Signature Vegas are brand names and/or trademarks of Victory Motorcycles and Polaris Industries, Inc.
HD Wheels Corporation is the copyright owner of all text, images, and other material contained on this sight. 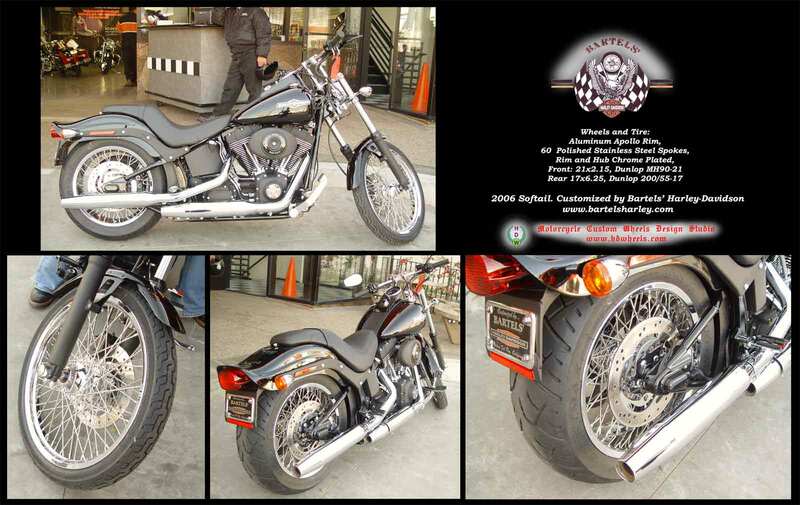 Copyright 2004-2013 by HD Wheels Corporation. By entering this Site you acknowledge and agree that nothing contained on this Site shall be construed as granting rights, by license or otherwise, to any HD Wheels Corporation intellectual property rights, including but not limited to copyrights, patents and trademarks.